Once there was a Collie–we’ll call Taffy, for her golden-hued coat–who struggled with a life that was anything but golden. She’d been abandoned in a park in central Washington state. She scavenged to find food, but it was never enough and as days turned into weeks, her body became gaunt; her once-beautiful coat, dirty and matted. A woman with a small rescue group learned of the Collie, and went to her aid. Things were about to get a lot better for our girl. “When they called to ask if we could take her, they had already given her a bath and pretty much shaved off her coat,” says Steve Thein, the Collie breed rep for the Seattle Purebred Dog Rescue, whose motto is, Where second hand dogs give first class love. “She was just skin and bones, but very very sweet.” For every mile of the long ride to Steve’s home, Taffy rested her head on his shoulder. 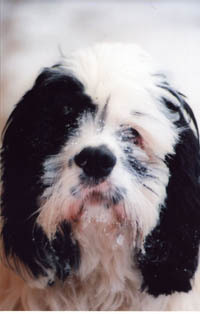 Steve and his wife, Kim, live with their six Collies, and at any time, numerous foster dogs. Although he’d been assured that Taffy had just given birth, he couldn’t help but wonder… really? He took her to his vet, who smiled and said, “Let’s just take an x-ray.” And sure enough, the film revealed seven puppies! And they were due any day… Steve, who’d planned to leave on a vacation, canceled it. He was on puppy watch. And he called in reinforcements: Judy Byrd, another SPDR guardian angel. They didn’t have to wait long: four days later, at 10p.m., Taffy went into labor. It was soon apparent to them, however, that Taffy was weakened from her ordeal, and she would need a vet to help the birth. At 2a.m., the vet began an emergency cesarean delivery. 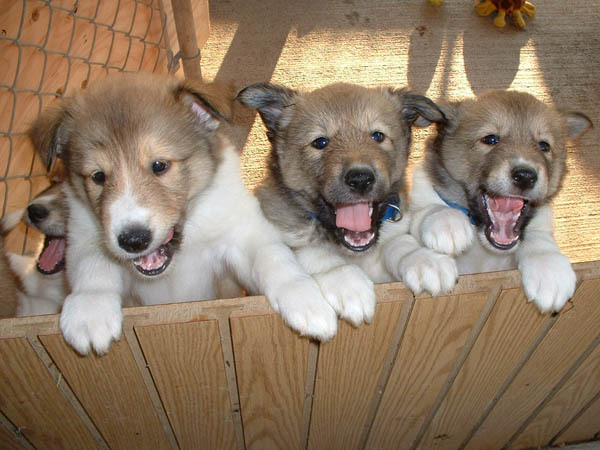 After six squirming pups were born and rubbed-down by Steve and Judy, they thought they were done… No! There were three more! “It was the most amazing thing I’ve ever seen,” Steve says. “And Taffy was a fabulous mother. The pups each weighed 13 oz. at birth, and they all could fit into one little shoe box!” Of course, that was soon outgrown, as at first they gained a pound-per-week, and later, 1.5 pounds each and every week. “It was lots of fun!” Steve says. 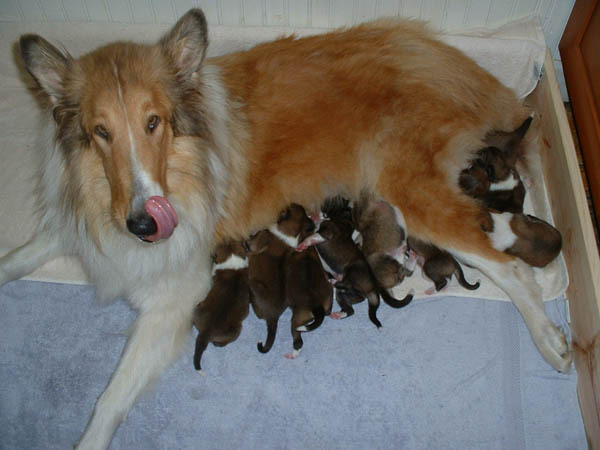 “But no one warned us how much nine puppies poop or how many wee pads we’d go through!” Taffy was fed 4x a day, and when her pups were four-weeks-old, Steve supplemented their diet with Gerbers rice cereal and goats’ milk. With NINE puppies, there wasn’t a dull moment at the Thein household! At about 6-weeks, the puppies developed a little curl in their tails… Was that a clue to their parentage? Echoing new parents everywhere, Steve says, “We didn’t care what they were, we were just happy that they were so healthy.” As adoptive families were screened, Judy–invaluable throughout–prepared the puppies’ dowry: Each puppy left for their new life with a baby blanket, puppy food and–perhaps most importantly–a tuft of Taffy’s golden hair. One extraordinary family fell in love with Taffy, adopted her, then returned to adopt one of her handsome sons. Another excited new puppy-mom did a DNA test, which revealed that the father was a Siberian Husky… And then, they were gone, into a bright & shining future. With all the kids gone from the nest, did it seem a just little too quiet, Steve? Photos courtesy Cooper’s hero, Steve Thein. Thanks!